Rig - K3 @ 5W, Ants: 40M inverted-V @ 80ft & 80M inverted-V @ 100ft. 40M - 46 QSOs 80M - 13 QSOs. Called by HA3MK on 40M and UT1IR on 80M. By far the most Q's I've had in a Spartan Sprint. Location: Freeport, Grand Bahama. Thanks for the Q's! For the December SP, I got out the lighter weight equipment to give it a re-test run in preparation for some SOTA activations that I hope to do this coming spring and summer. Instead of the usual K3, I used a KX1 with its paddle, ear buds, and a 1.2 AHr gel cell. Still a bit heavy at 2.4 lbs, but much lighter than the K3. Strong signals from N0AR and KF0N plus a handfull of other stations made for an enjoyable time until 40 m went long in about an hour. Every time I get out the KX1 paddles it takes a while to get use to them. I'm using that as an excuse for the sloppy sending. Catch you all in the next SP. First run with new Steve Weber MTR, LiPo, Altoids Poor Man's Paddle and earbuds. Finally have a light station for the Spartan Sprint and didn't many on. Go figure? My thanks to K2ZC, K4BAI, KE0G and WA8ZBT right at the close for my contacts tonight. Well after a long absence I thought I'd give the SP a shot. Couldn't stay the whole time but made a few for the WA mult. Didn't get going until 02:30 so went directly to 40M and condx were excellent. Made 11 Q's and then ate dinner. Got back on the radio at 03:20 and worked AL and MN on 80M. I could hear Bob C6AKQ (N4BP) CQing on 3560 but he never did hear me. On 40M I worked C6, GA, TX (3 times), MN IA, ID, OH, VA, MS. So a pretty good outing tonight. I haven't done SP in many months so it was fun to get into it again. BTW, thanks Randy K7TQ for hanging in there on 40M. One QSO on 20, 21 QSOs on 40, 15 QSOs on 80. 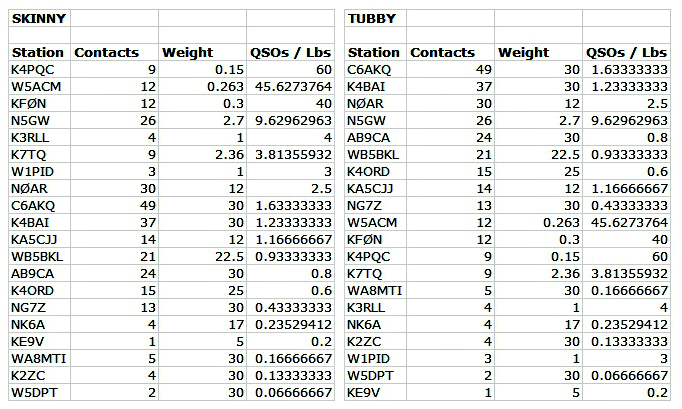 WB5BKL on all three bands. Pretty good conditions on 40 and 80M, but need more activity. Happy Holidays to all and see you this weekend in the ARRL 10M contest from NQ4I (guest op both modes) and next month for another Spartan Sprint. Only got on for the last hour as we had our local club Christmas dinner tonite, made 2 QSOs on 40 then on to 80 where the qrn was kicking up a bit, seems at times I could hear stations that were in the qrn but too weak to copy. Made 3 qso's on 40M and 12 on 80M. looking forward to the ARRL 10M CW CONTEST this weekend, hope the band is in good shape. Rig: K2 and 40M Inverted V @ 5 watts. I've operated this event a few times before but thought I would submit a log this time (a first). Good band conditions on 40M here. Worked stations on both coasts. Made one contact on 80M with my setup. 40 seemed to be in good shape - I heard some very good signals. I enjoyed my 1 hour of activity and hope to try again next month. Thanks to everyone! My usual setup of K2 at 5w to one of two 100' wires. Started on 20 but no one answered any calls. Went to 40 after 5 min and there were a few there - 8 Q's, 6 SPC - but not much activity. The band was quiet, virtually no QRN and seemed to be on the long side. Went to 80 after an hour and things picked up. 16 Q's, 10 SPC's there. Virtually no QRN, very quiet for 80. Sounded more like 20 often does. The band seemed in good shape. Worked from WA to C6 (although WA really was ESP). Worked C6AKQ, N0AR, WB5BKL, and W5ACM on both bands. 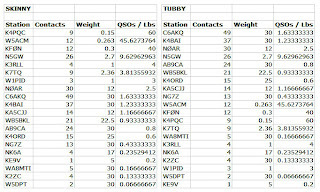 Bob, C6AKQ, was stronger on 80 than 40. Good to hear everyone and thanks for the Q's. This is a good event, we just need more participation. This was my first sprint. I stumbled across the listing on one of my contest calendars and thought I would check it out. I recognized a lot of callsigns from other QRP events. I only made 4 contacts because this sprint runs at the same time as my local radio club weekly 10 meter net. I used my Flex 1500 and netbook with an estimated total weight of 5 lbs. to a dipole up about 30'. One contact was with K4BAI, a fox I have hunted many times. I'm not too sure about how to submit a log or soapbox so if someone would inform me of the correct procedure it would be most appreciated. Thank you for another great QRP event. I started out as none qrp (thinking I would just give others some contacts) then I detuned the radio and worked my last 2 of the 5 Q’s as QRP. N5DY, OK; C6AKD, FL; N5GW, MS; (ALL HP) KC5CLL, AR; N0AR, MN (BOTH QRP). Low noise on the 40 meter band about 7040 KHz and signals were 559. I enjoyed the fun. ATS-3 at 3 to 4 watts to an 80 meter loop antenna. A shorter daylight period and lower SSN resulted in no signals heard on 20 meters. High line noise also wiped out 80 meters, so all my activity was confined to 40 M. Holiday activities probably reduced participation too. Not many stations heard; no east coast signals either, but the Midwest folks were very strong, indicating intense NVIS propagation. My best CONUS DX was Paul, NG7Z (WA) who had a very good signal in here the whole evening. It was also a treat to work Bob, C6AKQ, who was a good 569 from the Caribbean. I look forward to seeing you all in January! The backup rig - my HEAVY ATS-3 in the Altoids can continues to perform quite well with three LiPo batteries, built-in keyer paddle and lightweight earbuds had 5W out and provided a final total of 12 QSOs. The batteries were fully charged this month, and I did a lot of calling CQ. Conditions were marginal on 40M, so it was difficult to make many contacts. QSOs with C6AKQ on 40M and 80M were a welcome bit of excitement though. 40M was good for 7 contacts, and 80M gave up an additional 5 QSOs. Plenty of regulars, and a few new ones this month. Strange propagation and NOTHING on 20M from my QTH. I was using my backyard vertical. Come on January! K1 at 3W with internal NiMH batteries to hb tuner and cfz at 40' hanging between two big oak trees. 40M was the main band as usual, but 80M was pretty quiet for a change. Since I had the 80/40 board in the K1, I couldn't check 20M. I could have made more contacts, but was also watching the NFL football game. HI! CU all next month. Operated the Small Wonders DSW 40 at 2 watts. Best DX was Bob C6AKQ. Worked only 40 meters because there was nothing on 20 or 80. Propagation poor. Participation poor. Only operated for five minutes. Had fun as always. Thanks to all. Only had a chance to work the Sprint for the last hour. 40 and 80 were the only bands I found active and these were fairly quiet here in North Georgia. I did have one contact in MN on 80 that was exciting. Using KD1JV's AT - Sprint 3-B running 4 watts to a 160 meter horizontal loop at approximately 30 feet. Bands were poor. Where was everyone? Only copied a few stations here for well over an hour. N5GW had the loudest signal. John, K4BAI has great ears. I thought I heard him on 80 but I wasn't heard. Next month I will try again. 0230 I gave up. K3/10 @ 5W to a wire delta loop, a dipole or a 40M extended double Zepp. Worked K4BAI on three bands and four stations on two bands. It was fun to work the C6 station, but my best DX was NG7Z in WA. Best signal here in the Texas hill country was WA8ZBT - only about 180 miles away. Thanks to all. Had fun. Band conditions were light. Only heard three stations calling CQ SP and was only able to work one of those, Bob, C6AKQ. Hoping for better conditions and more activity in January. See you then. Caught the sprint an hour into it. Only made one 40m. Went to 80m and heard more SPers but band was noisy here in MI. Managed 4 more Qs. FT817 was packed away so used the FT2000 @ 5w into doublet.